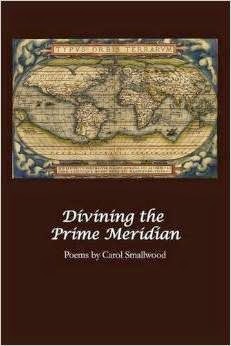 Award-winning poet Carol Smallwood writes poems that are easy to read and hard to forget. Her newest collection, Divining the Prime Meridian, raises the bar for creative, soul searching, and deep poetry. The poems are woven through the book in categories that might at first seem unrelated, but with Ms. Smallwood’s skill, Cities, Seasons, Geography, Domestic Life, The Natural World, The Mental Realm, and Health and Welfare are cleverly connected with an insight few poets possess. Smallwood eclectically mixes free verse poems next to sestinas and villanelles. She makes poetry seem easy …until I tried to write it myself. Poetry is most definitely not easy! Though many of the poems dealt delicately with negative aspects of life, Ms. Smallwood managed to torch the flames without setting the house on fire. Leaving the reader to ponder, is anything what it seems? The nostalgic poem, Clabber Girl Biscuits, contrasts loneliness and the desire to fulfill expectations of making a proper home. Smallwood’s knack of noticing the mundane and crafting memorable poetry is unique. The blatant sadness of Aida Sestina lingers long after closing Divining the Prime Meridian. This is a collection of poetry that deserves to be read slowly with a hot cup of tea close by; there is much to contemplate in these 116 pages. Ann McCauley is the author of Runaway Grandma, (2007) and Mother Love, (2004, Revised-2012). She’s a contributor to the anthology, Women Writing on Family: Tips on Writing, Teaching and Publishing, (2012) as well as the anthology, Writing After Retirement, (2014). Ann has an M.A. in creative writing. As a freelance writer; her work has been featured in online newsletters and journals, in magazines, professional journals, and newspapers. Learn more at annmccauley.com and like her on Facebook.